Crocodiles and their relatives the crocodyliforms, go back a long way and were as diverse as imagination itself. From land to sea, herbivorous species to giant predators, they can be held as one of the true great marvels of animal evolution. Their current representatives are smaller, but no less mean and successful, just as they have outlasted almost every other tetrapod group. 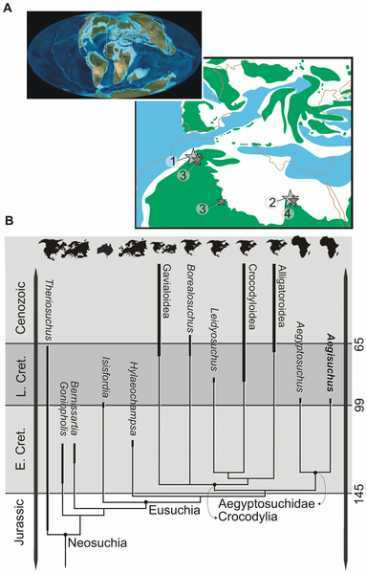 The Tethys Sea between northern Laurasia and Gondwanaland seems to be the real origin of the ancient crocodiles, instead of the Laurasian origin which was once thought likely. This map shows several species, all thought to be an early offshoot of the real crocodilian (and alligator) line. Africa is the home of many crocodilians. The journal, PLoS ONE has now released a paper from Casey M. Holliday (UM) and Nicholas M. Gardner (Marshall University, W. Virginia) revealing the Moroccan granddaddy of them all. Remarkable for their longevity, this Archosaur group has survived since the Late Cretaceous (Mesozoic), 95 million years ago. This species, Aegisuchus witmeri, had such an enormous 5-foot skull that its body dimensions are impossible to work out. 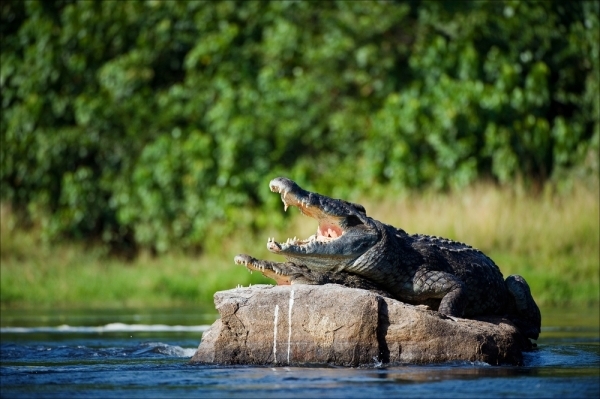 No similar crocodile is known, so the estimate of 30 feet is a guesstimate based on all of its relations. 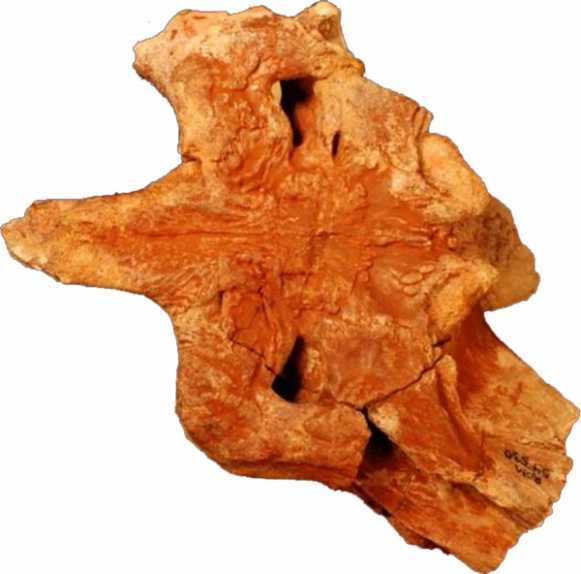 This thin-jawed ancestral form probably caught fish, like many of its modern descendants. It may even have created a trap with its long jaws and simply opened its mouth to swallow its prey. Other crocodyliforms ate plants, went marine or ate insects, but this one is a big bad croc just as we know them. Only the braincase is recovered from the rock, but that enables brain volume and hence skull size to be calculated. Closest relatives include a fossil that was destroyed by Allied bombing of Cairo in WW2 (Stomatosuchus) and another Egyptian, Aegyptosuchus, that survived to tell the tale. A huge shield on top of the Aegisuchus witmeri skull characterises this species, hence the 'Shieldcroc' nickname it has been given, but it clearly has the same skull roof as its Egyptian cousin. Modern crocodilians show the same morphology, but they are smaller, even though they still have those 'bad' habits.